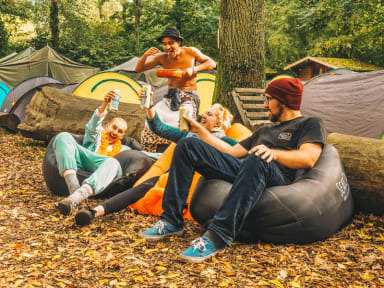 Festanation Kingsday Camp i Amsterdam, Nederland: Bestill nå! Please note: Group bookings have a 4 weeks cancellations policy. Failure to cancel within this time will result in a cancellation charge equal to the average of 1 night of your stay. Please note: The remaining balance will be charged 4 weeks prior to arrival. Payment link of the remaining balance will be send to you by email. If the remaining balance is not paid within this timeframe we cannot guarantee your reservation! Hello, fellow fun lovers and adventure seekers! Are you looking for the ultimate fun festival stay and a chance to meet like minded people/travellers such as yourself? 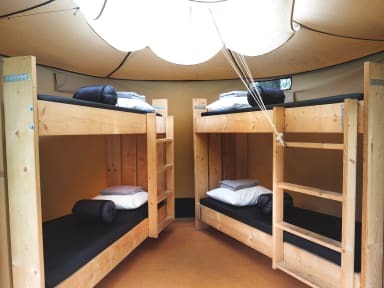 We have the perfect Amsterdam location set up for you young at heart travelers. Festanation is run by 2 crazy Dutchies (from Amsterdam) and an even crazier Kiwi-girl, with a team of wildly fun staff who love traveling, partying and giving others a good time. We can’t wait to meet you with a cold welcome beer and cheesy smile! We offer a variety of pre-erected tent choices from private to dorm tents! So get your crew together or come solo and make a crew here, before we book out! It’s going to be an awesome weekend of partying during King’s Day! Seeing we have the local Amsterdam living on lock down, we know the ins and outs of where to go, what to do and how to get the best Amsterdam and King’s Day experience the local way. We are located in the upcoming, booming Northern part of Amsterdam, it is surrounded by various famous A’DAM tower and party venues like Pllek, NDSM dock (famous for hosting the best parties & festivals). We are located in a small forest that just a stroll away from Amsterdam Central Station. However, it’s also important to sleep comfortably to power up for the next day, after fun packed days of sight seeing and a night partying, you can crash in your tent, warm up in your sleeping bag and wake up the next day surrounded by fresh air, birds singing, good vibes, happy faces and a delicious Dutch style breakfast. We can’t wait to meet you and show you a good time, the Amsterdam way! Payment upon arrival by cash or upfront via bank transfer or credit card. Transaction costs are excluded.